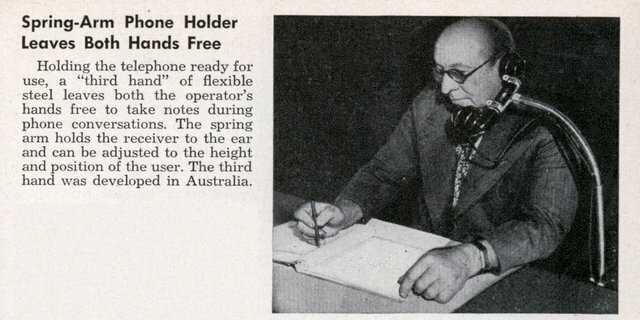 Holding the telephone ready for use, a “third hand” of flexible steel leaves both the operator’s hands free to take notes during phone conversations. The spring arm holds the receiver to the ear and can be adjusted to the height and position of the user. The third hand was developed in Australia. Meanwhile that left hand is slacking off, just sitting there, not doing anything! 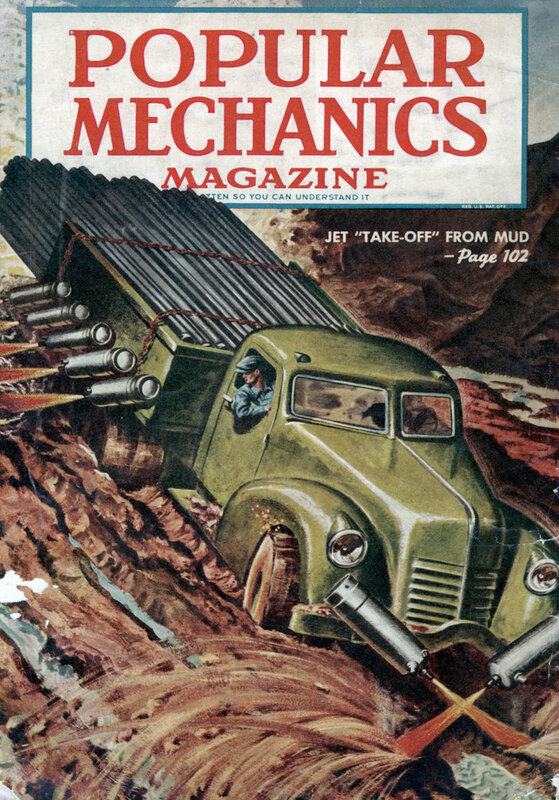 Here’s another item from 1948 (or 1946) I urge you to keep your eye peeled for: The original story about the rocket car–the source of all the legends that followed. I came upon this in a 1946 or 1948 magazine of that type that I’d bought at a yard sale. I tore it out about 7 years ago and mailed it to the head of the organization that hands out the Darwin Awards: someone in London with an Indian name. (I’ve lost track of it now.) I unfortunately didn’t make a Xerox copy. Anyway, the story was a half-page item, half of it text and half a photo, of an old-timey boxy car with two JATO rockets strapped to it that someone–it may have been one of the armed forces–was using for testing, or for sport. I can’t remember. So focus on those years and you may hit paydirt. I know there’s a lot of interest in trying to nail down the origin of this tale. Luckily we all live in an age of headsets and bluetooth ear clips.